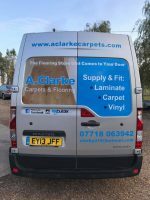 Very efficient quick to arrange and appointment quoted on the day fantastic price for good quality carpet, he even put himself out to lay my dining room carpet first then coming back the following week to lay the lounge to allow me to move furniture around fantastic service reliable and kept in contact would highly recommend and use again in the future. Omg I LOVE my new stair carpet professionally fitted by Aaron this morning, totally, TOTALLY recommend him. I just want to go and lay on the landing.